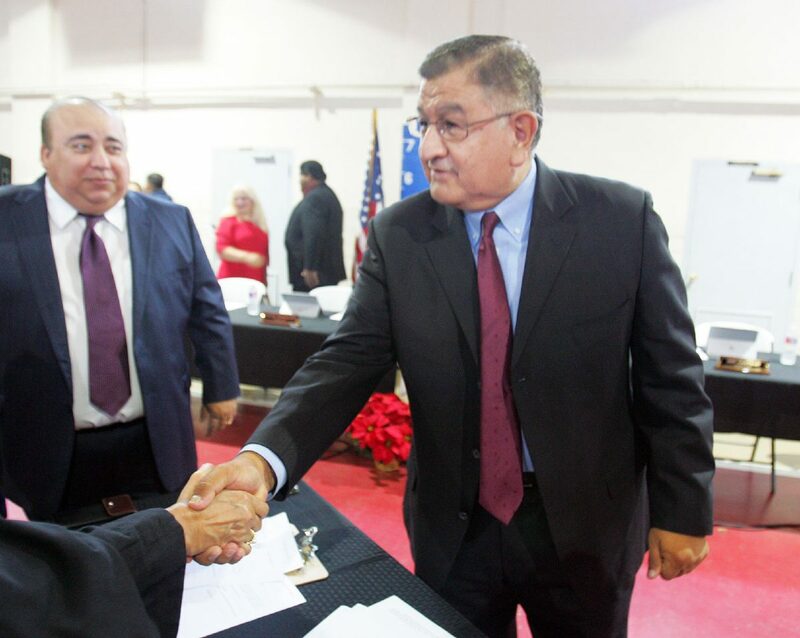 New Donna City Council, Place 3 council member Arturo Castillo is congratulated by well wishers after being sworn in at the Donna Recreational Center on Saturday, Dec 16, 2017, in Donna. DONNA — The Donna City Council’s newly elected leadership wasted no time making changes. Recently elected Mayor Rick Morales and his running mate, Place 3 Council Member Arturo “Art” Castillo took the oath of office Saturday morning before a special meeting of the Donna City Council. U.S. District Judges Ricardo H. Hinojosa and Micaela Alvarez administered the oath of office to Morales and Castillo, respectively. Donna Mayor Rick Morales speaks after being sworn in at the Donna Recreation Hall on Saturday, Dec 16, 2017, in Donna. Place 1 Council Member Oscar Gonzales — who ran alongside Morales and Castillo with the slogan “A New Day for Donna” — and Place 2 Council Member Joey Garza were present for the first meeting under the new majority. 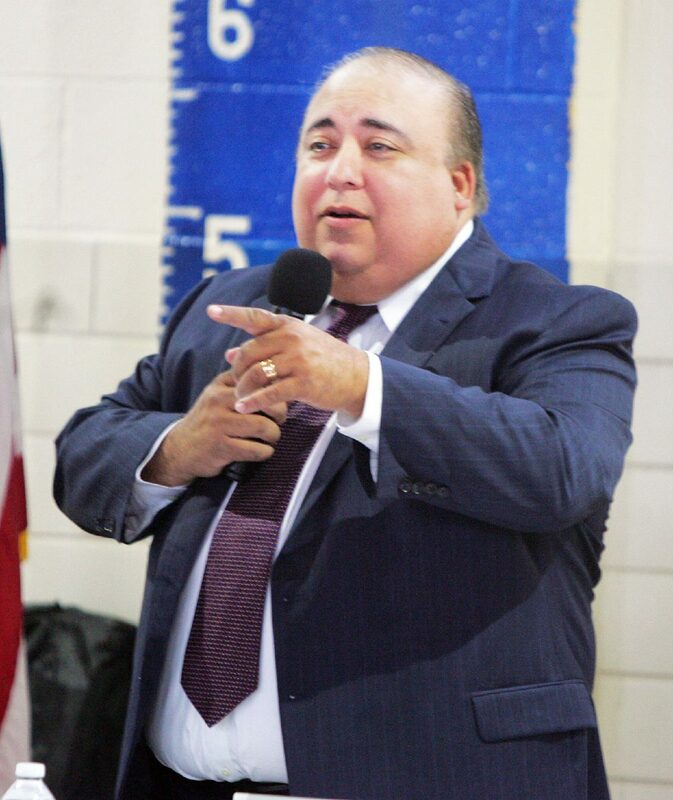 Following the swearing-in ceremony, the council promptly fired longtime City Attorney Eddy Trevino, who had been with the municipality for nearly a decade. The council then appointed Javier Villalobos who told The Monitor in an interview Wednesday he would consider returning to Donna as the new city attorney. Villalobos previously worked as the city’s attorney when Morales was first mayor. Not only did the council appoint a new city attorney, but also named Carlos Yerena as the new interim city manager. Yerena has experience with municipalities having last worked as city manager of Harlingen prior to leaving the post in 2015. He will work as interim city manager until the council decides on a permanent city manager. “He has a good feeling of what Donna needs, and I think he’s going to offer something for the betterment of the community,” Castillo said. Changes will not happen overnight, Castillo said, but rather over the next few months. “We’re going to work hard to do everything possible to get those issues resolved,” Castillo said of drainage, water rates and street improvements. Once the new council’s first moves were complete, the mayor and council members joined the crowd of dozens at the Donna Recreational Center for cake and sandwiches. State Rep. Sergio Munoz, D-Mission, and State Board of Education Member for District 2 Ruben Cortez Jr., were also present for the ceremony. The council will next meet Tuesday at 5:30 p.m.